He's baaack! The infamous St. Louis Rally Squirrel is back on another baseball card in 2012 Topps Series 2 Baseball. A toy version of the unofficial mascot of the Cardinals' 2011 World Series run appears on a short print variation of David Freese's #273 card. However, this time it's a prop version of the bushy-tailed rodent and not the real thing scurrying across the field. In 2012 Topps Series 1 Baseball, the Rally Squirrel appeared on a short print variation of Skip Schumaker's base card. On the card, the squirrel is shown scurrying across the batter's box. Schumaker is nowhere to be seen. The short print garnered lots of mainstream media attention and commanded huge sums upon its initial release. Amidst all the hype and mania upon release, the first copies of the 2012 Topps Baseball Rally Squirrel card topped $600 back in January. It has been a steady decline since, although the card still regularly moves for around $70-80. This time around, don't expect the same sort of attention or nutty prices. The Skip Schumaker Rally Squirrel card became iconic because of the mainstream attention it got. Love it or loath it, it was something different. 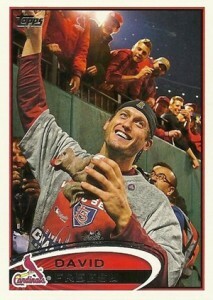 The 2012 Topps Series 2 Baseball David Freese variation merely pictures the 2011 World Series MVP holding a toy version of the squirrel during a World Series celebration. In fact, the rally squirrel looks more like a cheap chunk of Easter chocolate than the real thing. The player is still the focal point of the card. The demand for the card, like most all Topps Baseball short prints, will come primarily from set, player and team collectors. It likely won't carry much steam with speculators or casual collectors. The official release for 2012 Topps Series 2 Baseball isn't until Wednesday, June 6. However, packs are already popping up in retail locations. As a result a couple of the Rally Squirrel variations have appeared for sale on eBay. Stay tuned for more 2012 Topps Series 2 Baseball short print information as it becomes available. CHRISTIAN YELICH 2 CARD ROOKIE LOT 2013 TOPPS UPDATE RC 2012 Bowman SP RARE! Apprximately how many copies of these cards do u think were printed? And how much do u think i could sell mine for? 2012 Topps Series 2 HOBBY Box (Relic Variation SP Cut Bryce Harper 661 RC Auto)? 2012 Topps Series 2 Baseball Hobby Box - Factory Sealed!